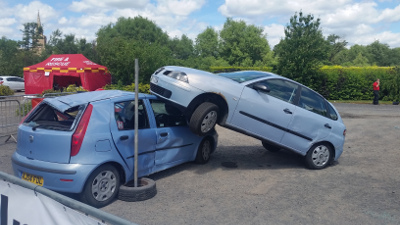 I went to see the Rescue Challenge at Webbs of Wychbold, near Bromsgrove in Worcestershire. This is an event where various Fire Services from around the UK compete in simulated rescue situations. The most dramatic of which is the two vehicle extraction where one car is positioned on top of another. PHP Quiz Program from www.penguintutor.com Also visit Days out diary.